SUPER. HOT. These are two words you will be saying after playing this game. SUPERHOT is a First Person Shooter, but not like you have ever played. 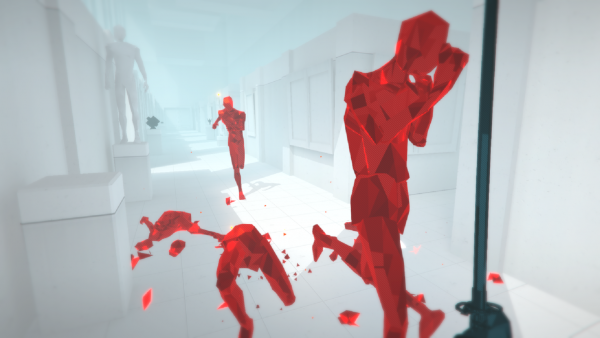 SUPERHOT is actually a really simple concept. You play as a nameless character, seemingly supposed to be you, in a sort of virtual reality game, where you dispatch with 'red guys' as they are called, by various means. Shooting them, punching them, even going at it with a katana. Guns have limited ammunition and the baseball bat weapon can break, but you can also throw your weapon to get the jump on the enemies. 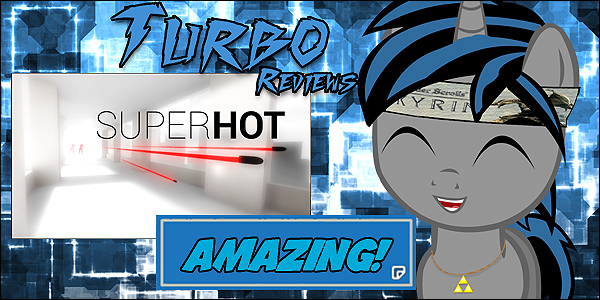 Here is where the twist comes in: SUPERHOT only movies when you do. While you are motionless, the game slows down drastically, to near stopping point, so you can strategically fight all of the enemies, as you die with 1 hit. Being shot once, be hit with a sword once, even being just punched once, is instant death, so patience and situational awareness is an absolute must with this game, but wow, is it fun. Your enemies all die in one hit as well, except for melee hits which takes 3, so the odds are also in your favor if you are careful. While a simple concept on paper, it is incredible how well executed it all is. The thrill of getting a huge kill chain while not be touched is exhilarating beyond belief, especially since this game doesn't mess around. 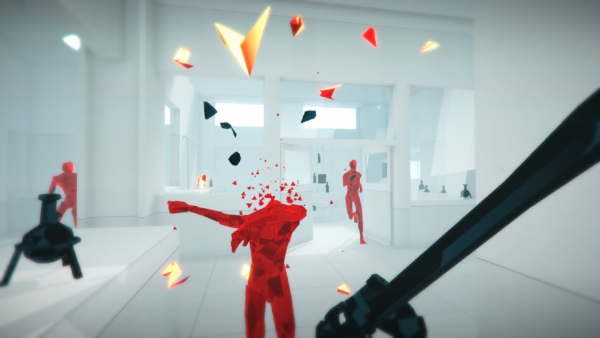 Even the visuals and sounds are simple, with a very crisp look consisting mostly of white for the background, black for weapons and objects and red for the enemies. It is simplistic but works flawlessly for the concept. IT keeps everything easy to see and once you get the hang of the way the game works, if you are patient enough, this game will keep you coming back again and again. There is a story mode surprisingly enough and this is actually what you must start with. You play through about 27 levels where you are given all that you need to get the hang of the game. This story mode, while incredibly short, was actually quite engaging, as there are some really interesting undertones to the entire thing and it will have you wondering.  Like I said it is short though, it can be beaten in about two hours, so sadly the story just doesn't last long. Once you complete it though, you unlock a plethora of new content, such as endless modes with different arenas and variants, challenge which has you going through the story mode with specific conditions and more. This, a long with the addicting gameplay, makes this one of the most fun experiences I have had in a game in a long time, let alone an FPS. To me, this game has very little in the way of flaws. Firstly, the hit detection can be a tad finicky in you are close to a wall's edge. Sometimes a bullet will hit the empty air right next to the edge or when you throw a weapon, the weapon might go at an angle that causes it to hit a wall unexpectedly. This is something that is not a major issue mind you, but it is something I experienced. Other than that, perhaps a slightly longer story would have been nice, but this just doesn't detract from the overall package. Say what you will, but I would take this $25 unique FPS experience over any generic COD title with it's $60 price tag AND $50 season pass any day. SUPERHOT is simply an amazing game. 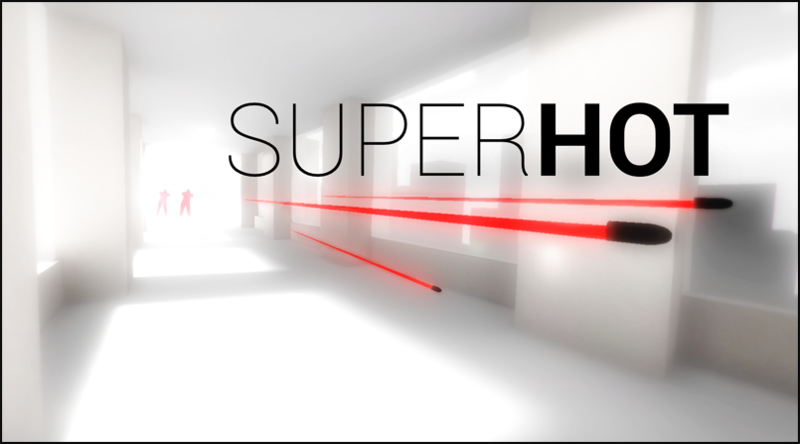 Born originally out of a 7 day gamejam, this is a first person shooter that will make you rethink how an FPS can be done. The addictive gameplay, crisp graphics and old school vibe will keep you coming back again and again without fail. If you are tired of all of the dull and generic shooters on the market today, do yourself a favor and buy this game. 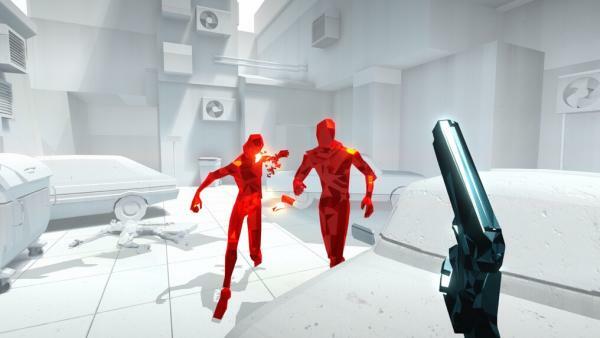 It is the most innovative shooter I have played in years. And there you have it. This is one of the best games I have ever played.